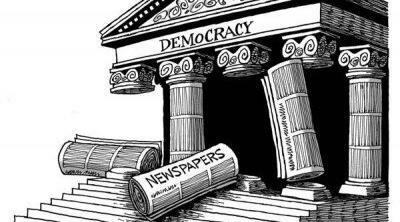 Is Journalism and "The Fourth Estate" Dead? Journalism thrives in a culture where the population seeks to be educated; in cultures (like the United States) where the population does not take pride in education and critical thought, journalism is demonized. Americans have become so politically divided that they won't know good, true journalism if they saw it. Anyone with a smartphone can be a journalist today. Journalists are pushed to collect links and ad money instead of serving their traditional function. Traditional media institutions have all "picked sides" and this bias detracts significantly from the public trust. New age media encourages surface level headlines and positions instead of in depth understanding of issues. The media are not much worse than they have been. Their insufficiencies, and there are some, are just more obvious in the age of idiocracy. “Journalism” here, has not been defined. It is a broad practice with a variety of areas. For example “investigative journalism”, which is dominant on cable, is not the same as “reportage” which is generated *unbiased* or without editorializing which is another area, “opinion” writing. Given this it’s incumbent on those criticizing media to know they are applying the correct standards of criticism to the area being critiqued. Cable news standards are usually set by ownership and auduence target. helped revive news media by piquing public interest, leading to a boost in subscription numbers. There are still well respected journalists that intentionally act/write/comment without bias. Journalists still expose truths in mass even if you have to review multiple sources and read between the lines. Journalism has learned to survive by adapting to modern media. Public figures still rely on journalists to communicate with the public in a more formal/respected manner than social media.